Computers undermine communism. In the 1960s there were those who thought that computing would strengthen centralized economies through greater efficiency in state planning. The microchip destroyed those expectations and instead reinvigorated decentralized capitalism. 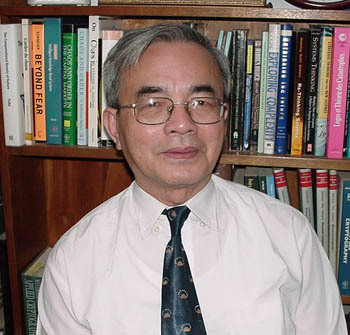 One who personifies the tension between computing and communism is the Vietnamese mathematician Phan Dinh Dieu. He is one of the few tolerated outspoken critics of party dictatorship inside Vietnam. Before the party congress in 1991, Dieu wrote a petition to the leadership pleading for democracy and suggesting that the party abandon Marxism-Leninism. The petition was not published, but was widely circulated. In September 1992 Dieu gave the following interview at his research institute in the suburbs of Hanoi. ST. Professor Phan Dinh Dieu, in 1982 you published an article in Vietnamese Studies under the heading “Applying mathematics and computing”. How come you are now trying to apply “democracy” as well? ls there any reason why a mathematician should be a politician? PDD- I am not a politician, but I want to participate in my country’s decision-making as an ordinary citizen. I consider myself a patriot with a passion for poor people, and therefore I want to contribute to my country’s development. As a scientist I discovered quite some time ago that Marxism-Leninism had little to offer a country trying to overcome poverty. While studying computer science, systems theories and the problems of modern management I realized that the socialist model such as defined in Marxist-Leninist theory is unsuitable to a society wanting to develop socially, economically and scientiﬁcally. For obvious reasons Marx and Lenin did not have any means of understanding our modern society. But the communist parties both in Vietnam and elsewhere naively tried to apply Marxism-Leninism to the modern world. The failure of their attempt was demonstrated by the computer revolution that characterized the world in the 19805. The failure of the socialist economic system is now realized by virtually everyone. What remains is to draw the full conclusion and abandon Marxism-Leninism altogether. ST. It seems to me that in the economic ﬁeld, the socialist model has already been abandoned in Vietnam. PDD. The main aspect of today’s situation is the contradiction between the ambition to preserve the dictatorship of the party while at the same time developing a free market economy. This is a new combination. No communist theoretician has ever contemplated such a combination on anything like a permanent basis. ST. Might not the current political system reflect an Asian, as opposed to a Western, concept of democracy? PDD. There may be a difference in the current political realities of Asia and the West, but this does not have to do with different concepts of democracy. Democracy is democracy wherever it is applied. The ﬁrst requirement of a democratic system is respect for human rights and the rights of the citizen. That applies everywhere. And the rights of the citizen must be respected by the holding of free elections. The key element in a democratic system is the way that leaders are elected. Democratic elections are free, with a secret ballot, and with the right for everyone to stand as candidates. If these requirements are not met, there is no democracy. Let me add that of course there can be various degrees of democracy. It is not perfect anywhere, not even — I suppose — in your country, or in Germany, France, the United States. The quality of a democracy can be measured on two accounts. The first is the way that the electoral system functions; does it provide for real choices, and to what extent do the results of the elections reﬂect public opinion? The second is the opportunity and capacity that people have to influence actual decision-making through discussions in the media, meetings etc., both on the local, regional and national level. ST. Does this mean that you favour a multi-party system in Vietnam? PDD. The essential thing is not to have many parties or a “multi-party system”, but to have a real choice. To have a real choice, two parties may be enough, but then there must be a real difference between them. ST. Don’t you fear that the introduction of opposition parties might endanger the current social stability and economic growth in Vietnam, perhaps even lead to chaos? PDD. Yes, I realize that there is such a danger”, that’s why I said two parties might be enough. One basic mathematical theorem says that a signed graph is in balance if and only if it is bipartite. If there are many parties, a political system risks to become chaotic – unless the parties combine forces around two poles. The two-party systems of the United States and Great Britain have been more stable than some multi-party systems, for instance the French system after the Second World War. But the current political system in Vietnam is a unipolar system. As long as it can keep down all opposition, it is stable, but a dynamic stability with a positive development can only be achieved by accepting the introduction of an opposite pole. Please note that an “opposite” pole does not mean destructive, but constructive. ST. The current Vietnamese leaders seem to have gone a long way towards accepting the freedoms of opinion and expression. PDD. The dictatorship of the party is no longer as fundamental as it used to be. There was a time when even our food rations were decided on the basis of our loyalty to the party. Now there is a lot more freedom, but in my view the years 1987 and 1988 were freer than the years since. At that time we experienced the beginning of a political and theoretical debate which was aborted by later developments. ST. Journalists are still encouraged to unveil and criticize corruption and abuse of power. PDD. This is true, but there are clear limits. The main prohibition concerns criticism of the dictatorship of the party. The party cannot be criticized as such on any level, not even the district level. Corruption can be allowed to be criticized since it is not a problem proper to our political system. It is a global problem. Corruption basically means to “sell power”. Power is sold in most, perhaps all, countries, but of course to a different extent. The current state of affairs in Vietnam enhances corruption. In a centralized communist society, corruption is reﬂected by the lack of a market. The benefits of power come from institutionalized privileges rather than from the selling of power. In democratic societies corruption is to some extent precluded by the lack of discretion or secrecy; the fear of being exposed or indicted reduces the temptation to sell power. In today’s Vietnam we have the worst of both worlds: a ﬂourishing market where power can be sold, and yet a very high degree of discretion and secrecy within the ruling elite. When some of us asked that the names be released of those officials who had obtained houses for free in Ho Chi Minh City by virtue of their public positions and then sold them on the market, we were not heard. The political system does not allow full exposure of corruption when it happens on such an important level. ST. Let me return to the question of democracy: Do you think that the “other pole” can develop within the current National Assembly? PDD. I have little faith in the new National Assembly [elected in July 1992]. The election consisted in a choice between a few candidates who had been handpicked by the party and the Fatherland Front. There were some 40 who tried to pose as “independents”, but only two of them were accepted as candidates, and they were not elected. The level of education of the Assembly members is much higher than before, but I see no one in the Assembly who can play an independent role. Discussions will be within the conﬁnes set by the party. ST. Where then do you see hope? Among the intellectuals? 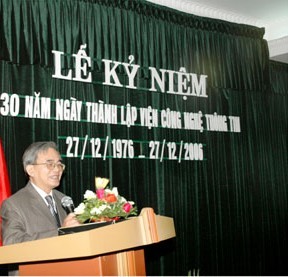 During the last party congress, the role of intellectuals in Vietnam was heavily upgraded. Giáo sư Diệu và IOIT nhân 30 năm thành lập. PDD. Before speculating about a possible role for the intellectuals, I would like to ask: Who are our intellectuals? Do we really have an intelligentsia in Vietnam, an independent social and political intellectual force? This is an important question to be asked of all societies that inspire to introduce or improve upon democracy. Let me ﬁrst mention the group of patriotic intellectuals who were educated in the French period. Among them there are many respectable and courageous personalities. Some of them are still with us, but they no longer wield much inﬂuence. In fact, there are very few left. We should cherish them for what they have done for the nation. Secondly, there is a very large number of specialists educated during the socialist period. In contrast to the French regime, the socialist regime educated specialists rather than intellectuals. We have a great many mathematicians, physicists, biologists, engineers ctc.., and are now having more and more economists. But they were never taught to think about society. The party was to do the thinking for everyone. The political awareness of the specialists is generally weak. The best of them participate in government and, quite naturally, belong to the party. It is possible that many specialists harbour democratic ideas privately, but we don’t really have any means of knowing if such is the case. Thirdly, there are the intellectuals of the former South Vietnam. Most of them have left the country. They may of course come back and serve the nation in various ways, but to play a significant political role, intellectuals must be in close contact with people. A protracted exile is no good background for a positive intellectual force. Lastly, there are the young, those who were only recently educated or are now under education, and whose formative years have been characterized by Doi Moi [“Doi Moi” is the Vietnamese equivalent to “perestoika”]. These last years, we have had a re-invigoration of independent art and literature. But there still is a long way to go before these tendencies may coalesce into a real political and social force. All in all, I have to conclude that we lack an intellectual class. ST. Does this mean you are generally pessimistic, or do you see hope somewhere? PDD. It may surprise you after what I said about the dictatorship of the party, but I persist in hoping that the party itself will change. People who think responsibly about our country’s future must favour change with stability The best way to achieve this IS to convince the party that it should face realities and abandon its old ways. I have written petitions and I have talked to the party leaders, and at least they have listened. You see the party has two sides, the communist side and the patriotic side. If it could keep the latter and abandon the former, it might transform itself into a genuinely patriotic force. Some of our top leaders, to my knowledge, are very sincere men. ST. But how then would you get your “second pole” ? PDD. That will be the real test of the responsibility and courage of the leadership If they are to be real patriots they must accept the transformation of the party into a patriotic party with full respect for the basic freedoms and they must introduce free elections. And under such conditions other political organizations will appear which will gradually develop into a constructive opposition If the party transforms itself along such lines, it may win all elections for a long period ahead. ST. And do you see a role for yourself in this transformation? Are you Vietnam s Sacharov ? PDD. As I said, I am not a politician and I have no ambitions. But as a scientist and a patriotic citizen, I want to participate. Democracy requires participation. HM Blog. Bản tiếng Anh này do bạn Xôi Thịt dùng phần mềm nhận dạng chữ viết quét và đưa ra file word. Cảm ơn XT nhiều. 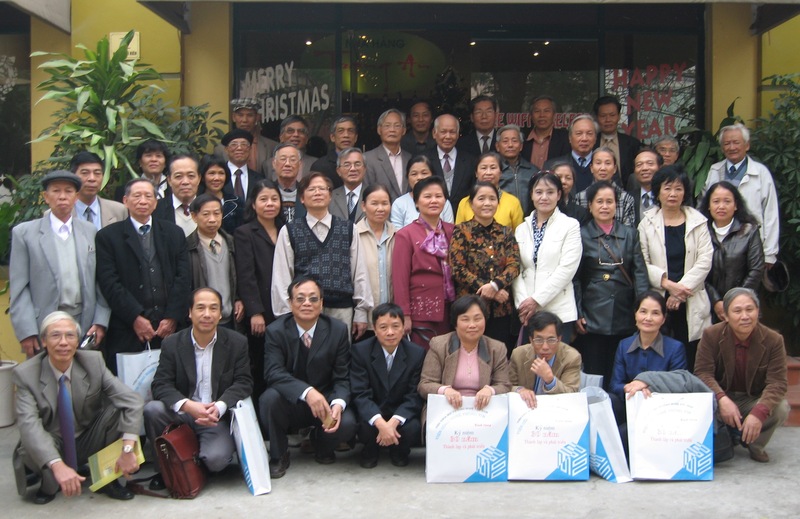 This entry was posted on Thursday, February 2nd, 2012 at 5:01 pm and is filed under Bạn đọc viết. You can follow any responses to this entry through the RSS 2.0 feed. Both comments and pings are currently closed. Cảm ơn anh Hiệu Minh. Xin anh cho copy về!